Here is a fun project that even adults have enjoyed making. Become a daffodil hybridizer! The form and color combinations are endless. Trace the patterns onto the tissue paper. Cut out the tissue paper shapes. Fold over the tip end of a pipe cleaner. Poke the other end of the pipe cleaner through the center of your two layers of cup shapes. Next poke it through the center of your two layers of petal shapes. Gently slide all the tissue paper layers all the way to the folded end of the pipe cleaner. Crease each petal from its tip to the center of the flower. Scrunch the entire flower into a flower bud shape, then smooth it open again. Bend the pipe cleaner stem to a 90 ° angle about ½” behind the flower. Scrunch the cup more to make it look ruffled. 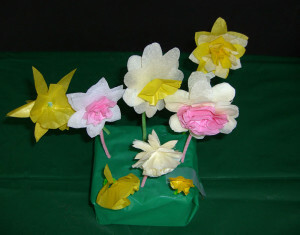 Add extra layers of tissue paper to make double daffodils. Separate and slightly rotate each layer for added fullness. Use markers to make a colorful rim on the outer edges of the cup or a green “eye” to the center of the cup. Add “pollen” by twisting a bit of yellow tissue paper onto the folded end of the pipe cleaner.